Not a "highway" recommended flag. Parade speed suitable. Due to this product being manufacturered by hand, an one inch size variation can occurr in sizing. 6/21/2018 – Is the POW/MIA Flag with Grommets a double sided flag? 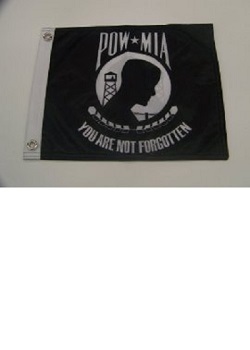 Response From Patriot Guard Riders: Yes the pow flag with grommets is a double sided flag.